“What I want the most in life is freedom for my compatriots and independence for my country”, said Nguyen Tat Thanh (Ho Chi Minh) when starting his journey to seek ways for national salvation. That simple saying contains the two basic points: national independence is the ultimate goal and integration into the world is the method to find out the way for his nation. Late Prime Minister Pham Van Dong, an excellent and close student of President Ho Chi Minh, one of the founding fathers of Vietnam’s modern diplomacy confirmed that “Independence and self-reliance combined with international solidarity and cooperation” is the cornerstone of Ho Chi Minh’s thought on diplomacy. Ho Chi Minh in general but sufficient manner referred to this point by saying that “Independence means we control all our activities by ourselves, without any external interventions”. All activities include political, economic, cultural, military, diplomatic fields. Finding the way to save the country throughout realities of the world though, he always advocated independence and self-reliance in thinking and action as well as flexible adoption of other countries’ experience to Vietnam’s condition. The most fundamental thing is we should set out policy and guideline for internal and external affairs by our own to strengthen the national solidarity bloc, promote the internal strength, take advantage of international support, bring about combined strength, gain and safeguard national independence, sovereignty, unification and territorial integrity as well as people’s freedom and happiness. Ho Chi Minh worshipped independence, self-reliance and self-resilience, but he did not fall into isolationism. As a member of the French Communist Party, Nguyen Ai Quoc had made significant contribution to the world’s revolutionary movement and national liberation movement with his famous theoretical point: Capitalism is a leech with one sucker on the metropolitan proletariat and the other on the colonial proletariat”. He was soon aware of the relationship between Vietnamese revolution and the world’s revolution, believing that “the Vietnamese revolution is part of the world’s revolution. Those who conduct revolution are all comrades of the people of Vietnam”. Therefore, he advocated broadening international solidarity and cooperation and combining the national strength with the strength of the times to fight against the enemy. With a sound strategic vision, Ho Chi Minh clarified the dialectical relationship between independence, self-reliance and international solidarity as well as self-reliance and international cooperation. He added: “Patriotism is to resolutely preserve national independence, freedom and territorial integrity. Internationalism is to unite with other countries and people to keep the world’s peace and counter imperialism’s invasion and war policy. Patriotism and internationalism is closely related”. In that dialectical relationship, “independence and self-reliance” always play a decisive role and provide a solid foundation for international solidarity and support. International solidarity and cooperation, meanwhile, are indispensable to the Vietnamese revolution and help create a favourable international condition and combined strength to maintain independence and self-reliance. The dialectical relationship between independence, self-reliance and international solidarity and cooperation is a manifestation of the relationship between internal strength and external strength. To strengthen international solidarity and cooperation, first and foremost it is necessary to promote independence and self-reliance: “A nation just looking for others’ help instead of standing on its own feet does not deserve independence”. Realizing the aforementioned viewpoint, Ho Chi Minh advocated active participation in international cooperation, on the basis of independence, self-reliance and mutual respect, with the guideline “Making friends with all democratic countries and causing no hate for anyone”. According to Ho Chi Minh’s thought, Vietnam upheld international solidarity and cooperation to take advantage of other countries’ support and in turn supported them and performed international duty. Thus, we both stepped up the resistance war and took part in the world’s peace movement. He advocated cooperation and struggle combined: our purpose is solidarity and we struggle for solidarity. The dialectical relationship between “independence, self-reliance and international solidarity and cooperation” is a principle of utmost importance in Ho Chi Minh’s thought on diplomacy. The Communist Party of Vietnam has inherited and developed it into a basic, central viewpoint on its diplomacy and international integration. The Political Platform on building the country in the transitional period towards socialism (supplemented and developed in 2011) has identified 8 major relationships to be grasped and well managed, with the 7th one: “between independence, self-reliance and international integration”. The Party and the State have flexibly applied Ho Chi Minh’s thought on independence, self-reliance and self-resilience combined with international solidarity and cooperation to foreign affairs and Homeland protection, gaining considerable achievements and making contributions to the cause of national construction and protection. Noticeably, we broke sanctions in the early period of renewal; basically completed demarcation of border with neighbouring countries; on the basis of respect for independence, territory and political regime, expanded relationships of friendship and cooperation with other countries; created a peaceful environment and took advantage of international support to build and develop the country; raised Vietnam’s prestige and status in the international arena and implemented the policy to protect the Homeland from afar. Basing on the results of defence, security, diplomacy and Homeland protection in the 30-year period of renewal (1986-2016) summarized in both theory and practice, the Resolution of the 12th National Party Congress laid down the diplomatic guideline of independence, self-reliance, peace, cooperation and development, and a foreign policy characterized by openness, diversification and multilateralization of relations, pro-active integration into the world in the spirit of being a friend, a reliable partner and a responsible member of international community. On the basis of both cooperation and struggle, diplomatic activities serve to maintain a peaceful, stable environment and bring into play at highest level external resource to develop the country, improve the people’s living condition, and resolutely, persistently fight to protect national independence, sovereignty, unification and territorial integration. In the years to come, global and regional situation will experience new, complicated developments. The unipolar world order will still remain, but a “flexible multipolar world order” is being shaped clearly with intertwined, multi-layer connections. Countries give first priority to their national interests in international relations. Cooperation, competition, struggle and compromise among major powers remain complex. Alongside opportunities and advantages, the country is faced with difficulties and threats in defence and security caused by hostile forces’ plots and ruses violating national independence, sovereignty and interests. That context poses new issues to the applying of Ho Chi Minh’s thought on “independence and self-reliance combined with international solidarity and cooperation”. First, it is necessary to uphold the viewpoint of independence and self-reliance; actively integrate into the world; manage national and international interests in harmony; be independent in politics, economy, culture, defence, security and diplomacy in the new situation; implement the guideline of “the invariable decides the variable”. Second, it is important to respect and well, flexibly, harmoniously manage relationships with major powers; consistently implement the policy: no allying with one country to counter another, no military alliances, no intervention in each other’s internal affairs, settlement of sovereignty and territory disputes by peaceful means; be vigilant against and prevent compromises among major powers over Vietnam’s sovereignty and benefits; and resolutely fight to safeguard national independence, sovereignty, unification and territorial integration. Third, there is a need for combined cooperation and struggle, with cooperation as the principal; implementation of international integration and defence diplomacy in pursuit of the motto: “Active, proactive, steady, flexible, effective”; pro-active anticipation and flexible management of all situations to avoid passivity and confrontation. Fourth, it is necessary to actively participate in international, global and ASEAN cooperation activities at higher levels, including the UN peacekeeping operations. To effectively realize directions mentioned above, it is vital to adopt the following main measures. First, to continue to study, review and grasp Ho Chi Minh’s thought on diplomacy during the process of laying down guideline and policy on diplomacy and performing diplomatic activities in tandem with the task of Homeland protection. Second, to enhance leadership capacity of the Party and role of the State, socio-political organizations and the armed forces towards the applying of Ho Chi Minh’s thought on diplomacy to the national protection cause. Third, to build and make the country wealthy and strong in all areas; to foster economic development, make it sustainable and reduce the economy’s dependence upon the others; to basically and comprehensively innovate education and training; to stimulate development and application of science and technology; to strengthen defence and security; to enhance the effectiveness of diplomatic activities; to create combined strength, raise the country’s status in international arena and maintain independence and self-reliance during the process of international integration. Fourth, to build revolutionary, regular, elite, gradually modern People’s Army to be the core in national protection; to build and implement the Strategy for International Integration and Defence Diplomacy in accordance with Ho Chi Minh’s thought and the Party’s new thought on Homeland protection; to facilitate international integration in other fields to achieve consistency in the country’s strategy for diplomacy. 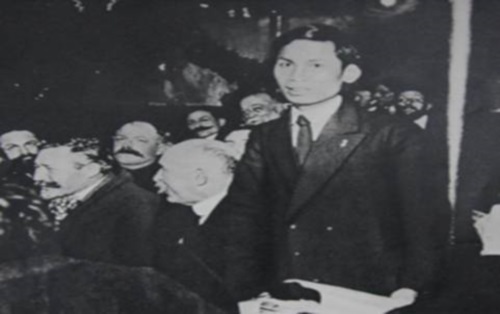 Ho Chi Minh’s thought on diplomacy, including the viewpoint “independence and self-reliance combined with international solidarity and cooperation, is an important part of his thought which is also the ideological ground of the Communist Party of Vietnam. Ho Chi Minh did not write many books or produce political doctrines. His viewpoints and thought were often expressed simply and close to the people but contained important issues for people from all walks of life to study and follow. Ho Chi Minh’s thought on diplomacy included methods, style and arts of diplomacy. His thought on diplomacy which is rich in content, simple in form and effective in method and style represents a crystallization of his knowledge. Thus, his thought, especially on diplomacy and Homeland protection, is a priceless legacy for us to learn all our life.